The new Harris Pontoon Boat Catalog features the entire lineup of pontoon boats for 2019. Stylish interiors are matched with proven construction techniques to make for a luxurious lineup of boats. The Solstice Series shows off new furniture vinyl patterns and an all-new RGB LED lighting package to give a splash of customizable color across all models in the series. Browse by model, or search through the list of available floorplans to find a perfect fit for your new pontoon boat. Build out your boat with desirable features and options like an upgraded JL Audio stereo system. Maximize your fun on the water with a performance package designed for an active lifestyle of skiing, wakeboarding, or just plain speed. Learn more about each model by visiting our videos page and build your dream boat using our boat builder. From Cruiser to Crowne, there’s a Harris to fit your lifestyle, find yours today. 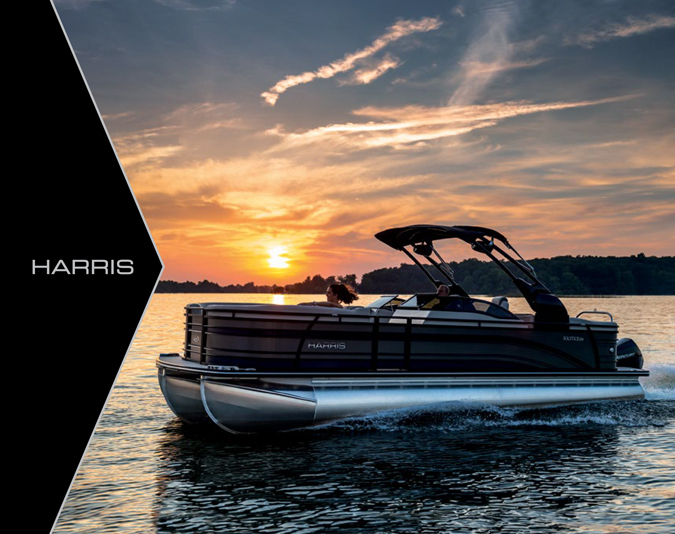 Click here to request the 2019 Harris Boats Pontoon Catalog or view it online.